MANILA, PHILIPPINES — The Malampaya natural gas field will continue to power a third of homes and businesses in the Philippines, thanks to a new offshore platform that is the country’s first to be designed and built in the country. Malampaya Deep Water Gas-to-Power Project joint venture partners—Shell Philippines Exploration, B.V. (SPEX), Chevron Malampaya LLC (Chevron) and the Philippine National Oil Company-Exploration Corporation (PNOC-EC)—led a ceremony at the Makati Shangri-La Hotel on October 5 to inaugurate the new platform, and mark the start of gas production. Malampaya joint venture partners press the start button to officially inaugurate the new Depletion Compression Platform. 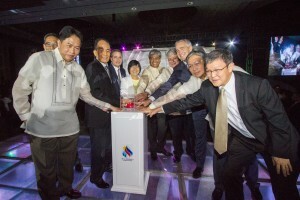 In photo are (L-R): PNOC-EC President Pedro Aquino, Chevron Malampaya LLC Asset Manager Sabino Santos (partly hidden), PNOC-EC Chairman and CEO Gemiliano Lopez, Chevron Indo-Asia Business Unit Managing Director Charles Taylor, Department of Energy Secretary Zenaida Monsada, SPEX Managing Director Sebastian Quiniones, Malampaya Phase 2/3 Project Manager Antoine Bliek, Royal Dutch Shell Chief Financial Officer Simon Henry, Shell companies in the Philippines Country Chairman Edgar Chua and Shell General Manager–East Operated Projects Simon Ong. The new offshore platform–a Depletion Compression Platform (DCP)–is adjacent to the existing Malampaya Shallow Water Platform, located some 50km offshore from Palawan in western Philippines. 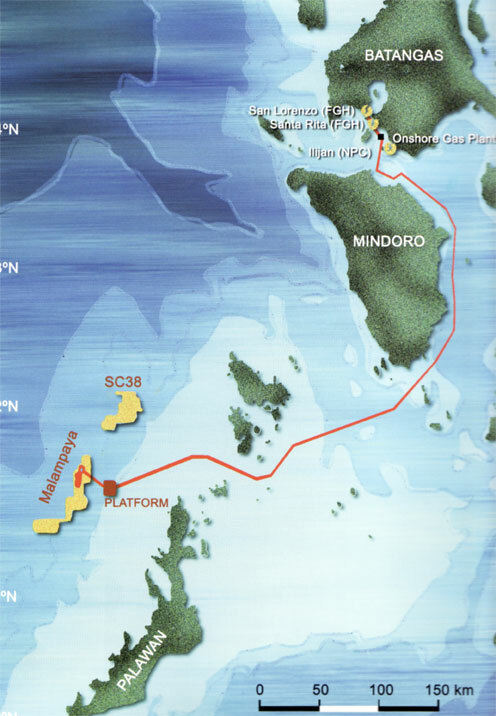 The event also commemorates the 25th anniversary of Service Contract 38 (SC38), which laid the foundation for the Malampaya Deep Water Gas-to-Power Project. The late President Corazon C. Aquino signed SC 38 on behalf of the Government in December 1990. 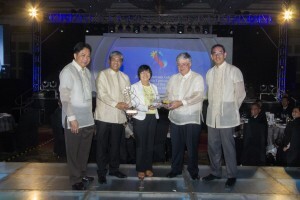 Malampaya joint venture partners present a sculpture made of scrap metal from the Depletion Compression Platform and a scale model of Malampaya to Department of Energy Secretary Zenaida Monsada during the inauguration ceremony. In photo are (L-R): PNOC-EC President Pedro Aquino, SPEX Managing Director Sebastian Quiniones, Department of Energy Secretary Zenaida Monsada, Malampaya Phase 2/3 Project Manager Antoine Bliek and Chevron Malampaya LLC Asset Manager Sabino Santos. • The Malampaya Deep Water Gas-To-Power Project is one of the greatest industrial undertakings in the history of the Philippines. Acknowledged as one of the best examples of a highly successful public-private partnership, the project is spearheaded by the Department of Energy and developed and operated by SPEX, on behalf of joint venture partners Chevron Malampaya LLC and the Philippine National Oil Company-Exploration Corporation. • Malampaya fuels three natural gas-fired power stations with a total generating capacity of 2,700 megawatts to provide 30% of the country’s energy needs. • The construction of the new Malampaya platform generated more than a thousand direct jobs as well as more business for local companies supporting the project. Workers tapped for the construction underwent mandatory training to elevate their competencies to meet world-class standards. The Malampaya Health Safety and Environment Training Center has so far upgraded the skills and technical knowhow of more than 6,000 Filipino workers to international standards recognized by the Offshore Petroleum Industry Training Organisation. • This latest phase in Malampaya has placed the Philippines on the world map of oil and gas platform fabrication, and demonstrates the excellent technical capability of the Filipino workforce. The country now has a competitive edge in pitching for future oil and gas projects in the region and worldwide. • The Malampaya Foundation Inc. (MFI), the social arm of the Malampaya Deep Water Gas-to-Power Project, has implemented various Social Investment programmes in communities where it operates. The Bridging Employment through Skills Training (BEST), Galing at Negosyo Dulot ay Asenso (GANDA) and Sanayan sa Ikauunlad ng Kakayahang Pangkabuhayan (SIKAP) programmes teach beneficiaries from Subic and Palawan new skills that help them gain employment or establish their own businesses. The various Social Investment programmes implemented by MFI has benefitted more than 5,000 Subic locals and more than 500 Palawan locals in a span of three years.